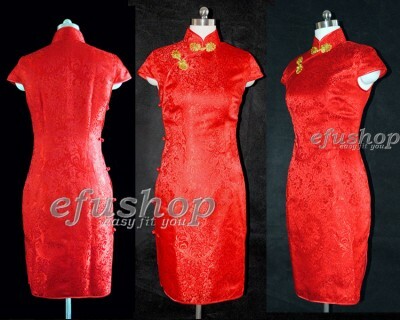 Red phoenix tail brocade cheongsam dress. Mandarin collar. Cap sleeves. Knee length. Double slits. Red trimming with red lining buttons at side opening. Gold buttons with beads on front opening. Elegant Chinese qipao dress.